Home / Do You Have These Sinus Drainage Symptoms? Sinus infections and allergies are a very common phenomenon among people all over the world. Sinus drainage symptoms can significantly affect your quality of life. Watch out for these symptoms and seek help at the earliest. Sinus drainage disease is a very common health problem. Often a bad cold is mistaken as sinusitis. The sinus is a cavity within another tissue or a bone. They are located behind the forehead, on the bridge of the nose, in front of the brain, and within the cheek bones. Sinus drainage is generally caused due to bacterial infections, viruses, and fungal infections. Sinus drainage can cause serious levels of inflammation and swelling in the nasal passages. Inflammation in the sinuses and the drainage through the nose can cause congestion, which results in difficulty while breathing. Patients suffering from this kind of sinus drainage symptoms often experience a reduced sense of taste and smell too. This is one of the most peculiar sinus drainage symptoms seen in the early stages of the disease. Mucus is a liquid that is produced on a daily basis by the intestinal tract, airways, stomach, nose, and throat. It serves to moisten these areas and helps in destroying any kind of bacteria or viruses before they enter the system as they could possibly cause infection inside the body. Excess mucus running down from the nose to the back of the throat is called postnasal drip, which is one of the common sinus drainage symptoms. This kind of sinus drainage symptoms is a result of the sinus getting infected due to certain bacteria. Discoloration of the nasal discharge (mucus) is a clear sign of infection. Thick yellowish-green colored mucus and foul smelling discharge is one of the common sinus drainage symptoms. Pain in the areas where the sinuses are located is another one of the most common sinus drainage symptoms. This is caused as a result of congestion, inflammation, and swelling of the sinuses when they are blocked due to bacterial infection or allergies. Patients suffering from sinus also experience heightened facial sensitivity. The face becomes tender as the sinuses located behind the nose, behind the forehead, eyebrows, etc. become sensitive. The mucus discharge from the sinuses running from the nose to the back of the throat can cause a lot of irritation. This irritation increases with time and results in a persistent cough, particularly causing uncontrolled coughing during the night. Another one of the common sinus drainage symptoms, a fever is the result of any kind of viral infection which could contribute towards sinusitis. Fever is often seen in the case of acute sinus problems. This type of sinus drainage symptoms is called halitosis. It is caused when the sinuses or the nasal passages are infected, and blocked. Bad breath is caused when the sinuses get infected and release certain substances that form nasal discharge. The pressure and swelling in the sinuses located in the frontal part of the head can cause serious headache. The blockage of the sinuses causes the fluid to be collected and results in massive headaches in the mornings as the fluids are collected in the sinus overnight. Irritation due to the postnasal drip can cause sinus drainage symptoms like sore throat along with severe itching of the throat. This condition can get worse with time if the illness is not diagnosed at the right time. 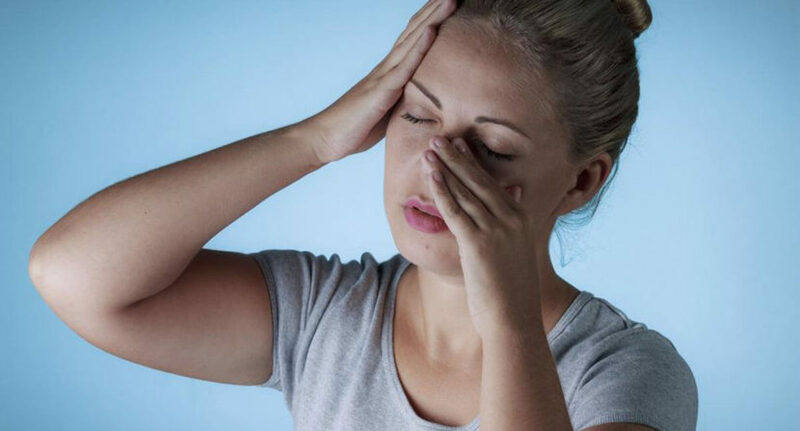 Treatment of sinus drainage symptoms can be achieved through the aid of various medicines, antibiotics, and devices that help control the disease. Sinus discharge infections may also develop into other complications such as meningitis, brain abscess, orbital cellulitis, and osteomyelitis. Hence it is important to seek help from a doctor immediately as ignorance or poor diagnosis can lead to prolonged discomfort and difficulty in breathing and pave the way for a number of other diseases.